What is the path of blood through the circulatory system? What is the path blood takes in the circulatory system? The purpose of the Circulatory System is to deliver oxygen and nutrients to all the cells in the body. The circulatory consists of the heart and all the bood vessels in the body (arteries, veins and capillaries). Arteries carry blood away from the heart. Veins carry blood to the heart. The smallest blood vessels are the capillaries and they deliver the blood and oxygen to the cells. The blood vessels is said to resemble the branches of a tree with the main artery being the aorta which leaves the heart. The aorta then branches into smaller arteries which then branch into capillaries. Image of path blood takes through circulatory system National Library of Medicine NIH. As shown in the image above there are actually two circulatory systems in the body. The systemic circulatory system provides food and nutrients to all the organs, tissues and cells in the body. The pulmonary system is the path blood takes through the lungs receiving fresh oxygen and releasing carbon dioxide. The oxygen in the lungs binds to hemoglobin which is contained in red blood cells. Blood circulation begins when the heart relaxes between heart beats. Blood then flows from both upper atrium's (left atrium and right atrium) into the two lower chambers (left and right ventricles) which then expand. Blood is then ejected (ejection phase) when the ventricles contract and pump the blood into the arteries. In systemic circulation the left ventricle which is the largest and most muscular chamber pumps blood containing oxygen in the aorta (the largest artery in the body). Blood then branches from the aorta to smaller arteries in the body. 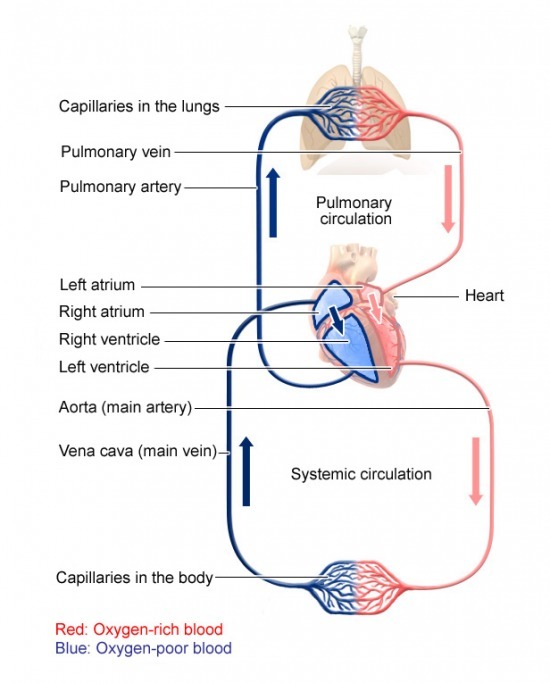 In pulmonary circulation the right ventricle which contains little oxygen and rich in carbon dioxide pumps blood into the pulmonary artery which branches into little capillaries which surround tiny vesicles called air sacs. This is where carbon dioxide is dropped and and oxygen is picked up. When we breathe out the carbon dioxide that was removed from the blood is exhaled and fresh oxygen is brought into the lungs. Oxygen rich blood then returns to the heart via the pulmonary vein into the left atrium and then to the left ventricle where it is then pumped out of the body during the next heart beat which starts a new cycle of the systemic circulatory system.